118 New Zealand prisoners of war died when the Italian transport ship Nino Bixio was torpedoed by a British submarine in the Mediterranean. Their deaths, combined with the 44 men lost on the Jantzen in December 1941, amounted to nearly a third of New Zealand's POW fatalities during the Second World War. The Nino Bixio was hit while transporting Allied POWs from Libya to Italy. With another unmarked prison ship, the Sestriere, it had left Benghazi for Brindisi on 16 August, escorted by two destroyers and two torpedo boats. Crammed aboard the Nino Bixio were almost 3000 POWs captured in North Africa, including more than 160 New Zealanders. The day after it left Benghazi the convoy was attacked by the British submarine HMS Turbulent. The Nino Bixio was hit by two torpedoes: one exploded in the tightly packed forward hold, killing an estimated 200 men and wounding another 60. In the ensuing panic and confusion many men jumped overboard. Some drowned immediately; others reached makeshift rafts and drifted around the Mediterranean for weeks without food or water. Those on board who had survived the carnage were hauled up on deck by rope. The injured were treated by medical officers. Despite extensive damage, the Nino Bixio did not sink. The ship was towed by an escorting destroyer to Navarino in southern Greece, where the dead were buried. The surviving POWs were transferred ashore, and those fit enough were shipped, after a short stay in Corinth, to Bari in Italy. 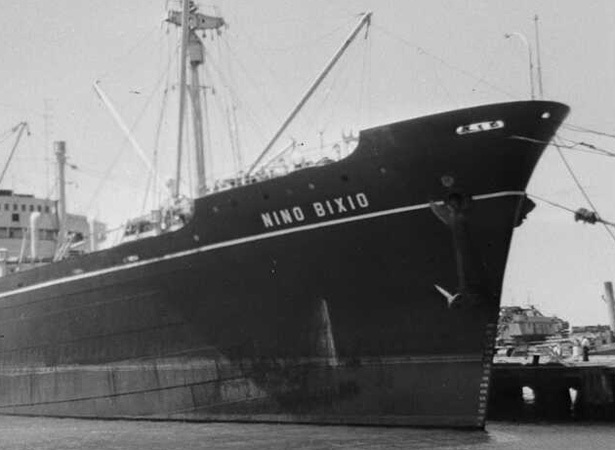 The Nino Bixio survived the war and visited several New Zealand ports during its post-war career as a freighter. Its attacker did not fare so well: HMS Turbulent was lost with all hands off the coast of Sardinia in March 1943. We have 10 biographies, 23 articles, 1 comment related to Attack on the Nino Bixio. A survivor of Turbulent telegrafist George Svenson went ashore prior to Turbs last mission and my Uncle John Deller returned from sick bay ashore. He related to me in 1983 that he decoded the message received during recharge on the surface at midnight that the War Office knew Nino Bixio was loaded with 3200 Allied POW,s and the 320 who were blown up in the hold were from NZ and Scotland and that survivors swimming off the ship were left there calling for help.Luck was in the ship was towed to be grounded and the remaining POWS were disembarked.. He also wept saying "if it hadn,t bween for that Captain Bligh all might be alive today"The crew had a fair understanding of him but also knew he was hard on the domestic targets like fishing schooners, single man boats and he always missed the big targets. This might be due to disinformation he may have received to protect the Italian capital ships for the appropriation in September 1943 Italian. In the terms of the Geneva Convention the action was illegal and immoral.New Zealand 2ND DIV warriors had experienced about 9 non arrivals of Artillery from UK in planned attacks in North Africa where infantry would attack during the night and move back under the cover of artillery which 9 times never materialised, the last time was Minca Quaim and Mersa Matruh.They escaped during the night but the machine gunners covering them got cut to pieces where they stood.A sane man was asking questions about this organisation. Hybrid action not beneficial to ordinary men on both sides.